Students and parents participate in Harrison Family Science Night. Last week it was announced by the Gates Foundation Pueblo Community College’s Gateway to College program was once again recognized with a Program of Excellence award. PCC was one of only 8 college partners in a 40 institution network earned the award this year! Gateway is an alternative high school education program designed to reengage motivated students who have difficulty fitting into a traditional high school setting. Instruction is provided by college level staff in a college campus setting. Nationally, Gateway graduates earn on average 23 college credits before receiving their high school diploma. Our Cañon City High School Gateway graduation will take place in Pueblo this year on the evening of Monday May 22nd. The Harrison K-8 School PTO put on a wonderful science night program last week offering students and adults opportunities to share the excitement of learning. This event has been a great a tradition at Harrison and was once again well attended by students and parents. I would also like to offer kudos this week to the Cañon City Middle School staff for the hard work they have been doing in regard to academics and school culture. CCMS 3rd quarter year over year data showed a 32% reduction in recordable student behavior incidents, a 17% reduction in the number of students receiving them, an increase in average daily attendance from 93.82% to 94.21%, and a decrease in academic failures of 43%. With more students in the school this year, fewer of them are getting in trouble, more are showing up on a daily basis, and more are passing all of their classes! 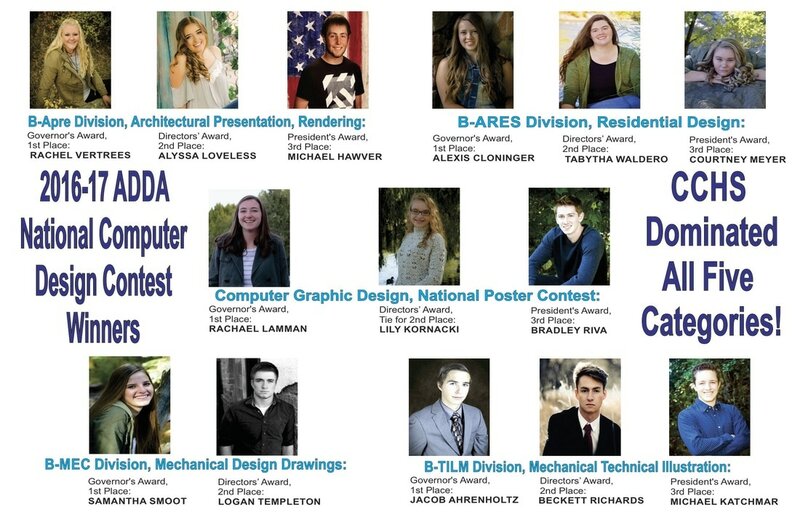 Last, but certainly not least, for the 24th year in a row the Cañon City High School Chapter of the American Design and Drafting Association once again won more awards in the National CAD design contest than any other high school or college in the nation! Rachel Vertrees, Alyssa Loveless, and Michael Hawyer placed in various categories in Architectural Rendering. Alexis Clonninger, Tabitha Waldero, and Courtney Meyer swept the category of Residential Design. Rachael Lamman, Lily Kornacki, and Bridley Riva dominated the Computer Graphic Design category. Samantha Smoot, and Logan Templeton took first and second place in Mechanical Design Drawing. Finally, Jacob Ahrenholtz, Beckett Richards, and Michael Katchmar swept the Mechanical Technical Illustration category. Unfortunately, this year’s contest marks the last during which our students will be guided day to day by long time instructor Michael L. Geesaman. Though Mr. Geesaman actually retired many years ago, he has continued to work with our students on a part time basis. I want to personally thank Mike for his years of dedicated service and his lifelong pursuit of excellence through our program! I want to offer congratulations to soon to be former Cañon Exploratory School principal Scott Morton, who was just named principal of McKinley Elementary School for the 2017-18 school year. Scott will be filling some gigantic shoes as he replaces Drenda Manning who helped to guide the McKinley learning community staff from Turnaround to Performance accreditation status over the past 5 years. Mr. Morton is quite a catch for the Wildcats, and his move to McKinley has triggered another principal search at CES that we hope to wrap up in the next weeks. At our board meeting last Monday director of student services Paula Buser announced CCSD will be piloting an expansion to our universal free breakfast program to all students in grades K-8 during the 2017-18 school year. Though it should seem this would be an increased expense on the part of the district, analysis shows increasing student participation in this program would actually result in a bit of a profit to our nutrition services program because of the complex formulas related to reimbursement for such programs. Though this would be a great outcome, our primary reason for this endeavor is to make sure all students are well nourished at the beginning of each day so they can focus on learning. Family and Consumer Sciences students share information about their program to incoming CCHS Freshmen. On Monday I finalized director evaluations, we submitted additional BEST grant questions, conducted interviews for the principal position at McKinley Elementary School, and held a school board work session and regular meeting. On Tuesday I held a SAC meeting, then travelled to Denver with school board president Larry Oddo to testify on legislation the district has interest in. Wednesday was a delayed start staff development day at all schools. I began it by meeting with classified association officers, then swinging by CES to discuss the process for conducting their principal search. I then attended a Regional Wellness Advisory Team meeting, and Harrison’s PTO meeting in the evening. I started the day Thursday touching base with RE-2 superintendent Rhonda Roberts, then hosted the monthly regional Manager’s Meeting, and ended my day at Cañon City High School’s 8th grade parent night. On Friday I met with our district liability insurance representatives and a number of local business leaders about our student intern and apprentice program, and ended the week in a board work session related to school and district staffing level decisions. The district is closed on Monday this week. On Tuesday I’ll begin my day at the Safety Town ribbon cutting ceremony at Fremont County Head Start. I’ll then attend a SAC meeting, participate in a Colorado Health Foundation Grant site visit, conduct an instructional leader PLC, and attend a quarterly Facilities Corp meeting to end the day. On Wednesday I’ll be working on academic improvement planning for the 2017-18 school year, and I’ll stop by KRLN radio with operations manager Jeff Peterson to record a show with Mayor Troutman. Thursday is booked with a number of meetings with parents, volunteers, community partners, and staff members, but I’ll also be attending the annual CASA luncheon, a Cañon 2020 meeting at the high school, and the Washington Elementary PTO meeting. On Friday I have a meeting about a potential school based health center grant, and will spend the afternoon screening candidates to fill the principal position at Cañon Exploratory School. Please don’t forget our Parent Advisory Group for Gifted Education will be holding its annual fundraiser pancake breakfast at Muggs restaurant on Saturday morning! Thank you for listening once again!